Unfortunately, most NFP’s will never be able to achieve financial independence through earned income and self generated revenue streams alone. They are always going to rely on donations (from public appeals, companies, charitable trusts and foundations) and government subsidies to make up the shortfall in their budgets. There is no disputing that the stronger an NFP’s financial position, the greater the impact they can have in their mission. But for most NFP’s, raising funds is a complex and time consuming task due to regulatory limitations, governance issues and competition in the sector. So besides applying for more grants, what else can an NFP be doing better in order to secure their financial futures? To be seen as a beneficiary worthy of grant money or sponsorship, NFP’s need to be engaging with the community in a positive way; earning trust and confidence and building a reputation for excellence. A strong reputation is an essential asset for any Not For Profit (NFP) organisation – even more so for charities that rely heavily on community goodwill for donations and volunteer recruitment. A sound culture is crucial to safeguarding an NFP’s reputation and financial sustainability. As discussed in Cognology’s Guide to a Great Onboarding Process onboarding equips staff with the skills, knowledge and confidence to not only do their job, but to do it well. Through a series of interactive formal and informal training, coaching, information sharing, goal setting, feedback, networking and social interventions, new staff better understand how the organisation operates and develop personal and professional networks to help them get things achieved more quickly. The more tailored and personalised the onboarding program, the faster the new hire will be up and running and performing at a high level. Good onboarding increases overall staff engagement and morale. And when staff are engaged, absenteeism is reduced – which in turn reduces the burden on already stretched staffing resources. poor information quality (including specified procedures and instructions from other people). It is no coincidence that organisations with less accidents and injuries are those that enjoy the benefits associated with well designed onboarding. The road to financial sustainability is a complex one for NFP’s. And it is one that cannot be navigated by numbers on a ledger alone. Onboarding supports the achievement of an NFP’s objectives by championing its mission and ensuring the fundamental spirit and values of the organisation are passed-on and adopted by every new staff member. Effective onboarding provides a strong foundation of skills, knowledge, and resources for staff to draw upon as they carry on the vital work of the NFP in the community – not only in the short term, but into the future. “Realizing the Value of People Management.” Www.bcgperspectives.com, Feb. 2012, www.bcgperspectives.com/content/articles/people_management_human_resources_leadership_from_capability_to_profitability/. 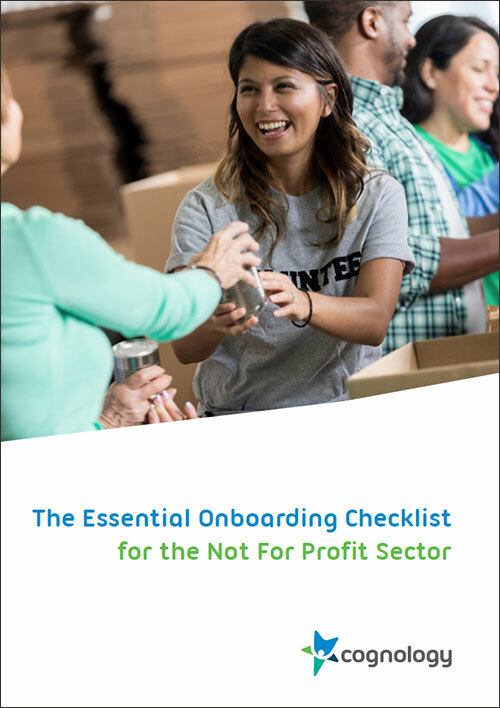 If you want to set up an effective onboarding process, download our complimentary whitepaper The Essential Onboarding Checklist for the Not for Profit Sector today.